Before moving to the farm in the spring of 1993, Christine and I sold our city house and spent three months travelling in southern Europe. We were following in the footsteps of past travellers, including literary figures such as Stendhal, Tobias Smollett, Percy Shelley, Charles Dickens, Robert Louis Stevenson, D.H. Lawrence and Evelyn Waugh, comparing our experiences with theirs in some of the most famous countryside in the world. In a Renault 5, we visited all of the places where wealthy Europeans passed the winter in the era before time zones and Boeing 747s, from the Costa Brava in northern Spain, across the Roussillon and Laugedoc in southern France and into Provence and the fabled Cote d'Azur. From there, we travelled down Italy's western coast to Sicily, paying homage along the way to the Tuscan countryside, Greek and Roman ruins, and the English travellers of the Grand Tour era. 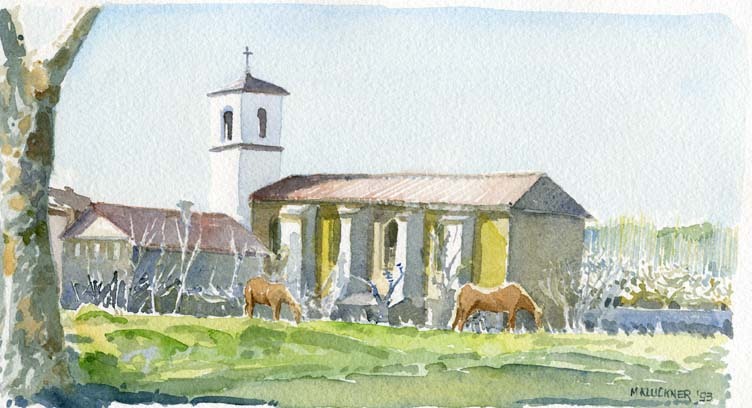 Many of the watercolours are pale and blue, accurately recording the winter light. I went back through the images in 2008 and repainted a few of them, smaller and brighter. The images and text below are a small portion of an unpublished manuscript. I had dialogues with several firms about publishing it, but couldn't interest any of them in the idea of "overwintering" -- it didn't make any sense to them in an era where summer is always just a plane-ride away. 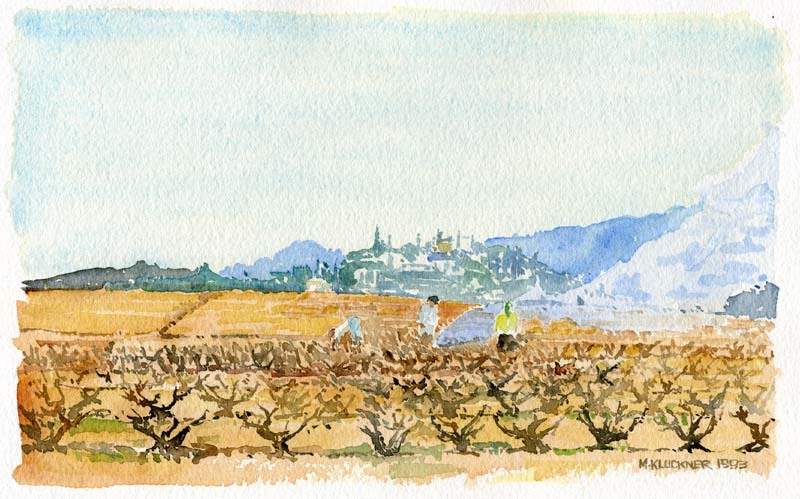 A 2008 repainting of a sketch of fields near between Mont Blanc and Tarrèga, north of Tarragona in Catalunya, Spain, in early December. 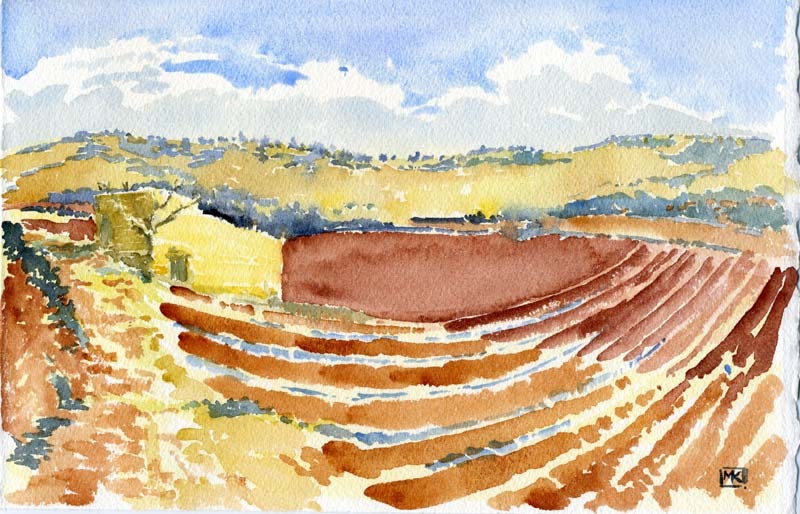 The land is ploughed and the hillsides terraced. The small abandoned farm buildings are built into the terracing, the side door allowing animals an exit into the lower fields. Reds, ochres and olive-and-lavender blues under a hard clear sky. Inland from the coast it was cold, and there was the sense of the old saying about Castilia being 10 months of winter and 2 of hell. Above: Rented a cottage in a lettuce field near the village of Theza near Perpignan. "Began to pour rain on Christmas Eve and continued without let-up until we left on the 26th, a Saturday morning. 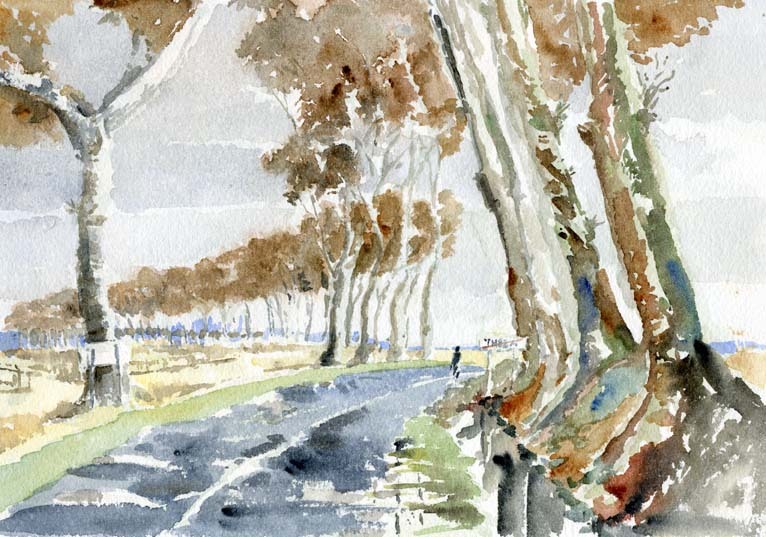 Painted the wet plane trees in the mist on the road south from Theza on Christmas Day. Got cold feet." The Canal du Midi in late December, near Port Argelliers, an area of mixed farming west of Beziers in the Languedoc. The old house was a restaurant, open only in the summer season, known as "Au Chat Qui Peche"--the fishing cat. 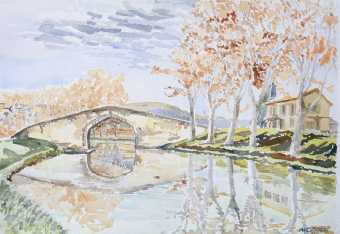 The water was still and slightly green; the plane trees, which line the canal for much of its meandering traverse of the Herault flatlands, hung onto their leaves until well into the winter. It was Boxing Day. 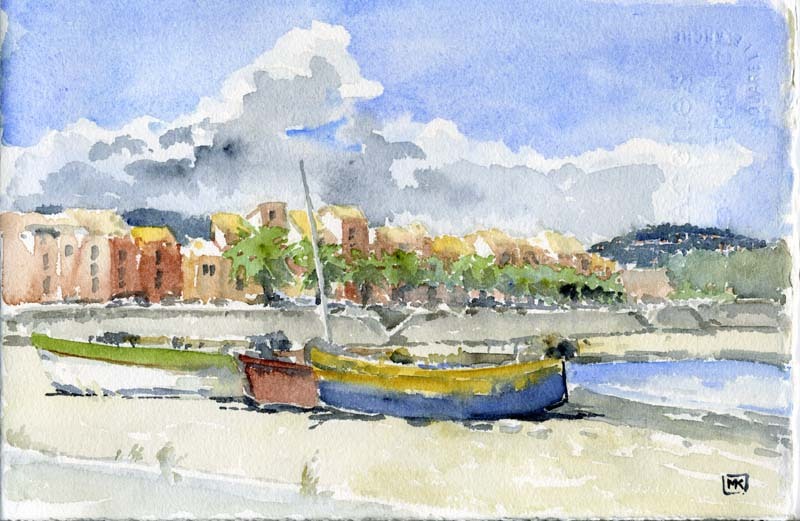 We had left our rented cottage near Perpignan, and were driving to an inn near Millau, to spend a couple of days before heading to Arles for the St. Sylvestre celebrations ringing in the New Year. We had a room, chambre 18, at the Hotel du Palais in Montpellier, overlooking a quiet square which attracted some wan sunlight in the early afternoon. It had been very cold, a froid intense through France. The sunlight attracted a few people to the outdoor tables of the cafes. We walked the streets until we were cold, bought Provencal fabric and some antique postcards, ate at a small restaurant which had a portable heater that worked. The usual practice in winter is for the restaurateur to seat the first few guests at window tables, which often are barely above freezing, in order to attract other people into the restaurant, and in several towns we almost got onto speaking terms with other prospective diners who were marching around the streets, stamping their feet to keep warm while peeking into restaurants and waiting for someone else to be the first to enter and be seated. 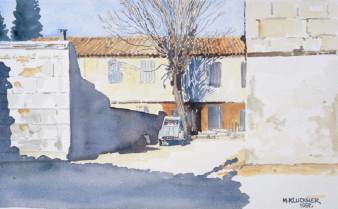 A Citroen outside a shuttered house near Pezenas in the Herault. The houses of plaster over stone, with shuttered windows and low-pitched tile roofs, are common to the Midi, having "the indescribable air of the South," as Robert Louis Stevenson described it. Christine, on the third-floor balcony of "La Provencal," a classic French one-star hotel in Bormes on La Cote d'Azur. The warm, early January sunshine reflecting off the hotel wall encouraged us to move table and chairs, wine bottle, bread, cheese and the crossword puzzle from the International Herald-Tribune out onto the terrace. The hotel was one of the last survivors along La Cote d'Azur of the sort of modest accommodation that used to make travelling so affordable in France. It offered demi-pension of rough-cut country food, served in a superb old dining room with an enormous open cooking fireplace (like in Catalonia). A palm tree grew through the roof. The hotel was falling apart in grand style--an oval, open, spiral staircase of shallow steps, three flights up to our room, 14-foot ceilings, two sets of French doors looking south into the low sun, plaster peeling and cracked, some repairs evidently underway, evidence of electricity in some dangerous-looking outlets, a TV with a coathanger for an antenna, and old hotwater radiators that actually worked! The balcony was about two feet wide, ran the length of the hotel, and was all ours. 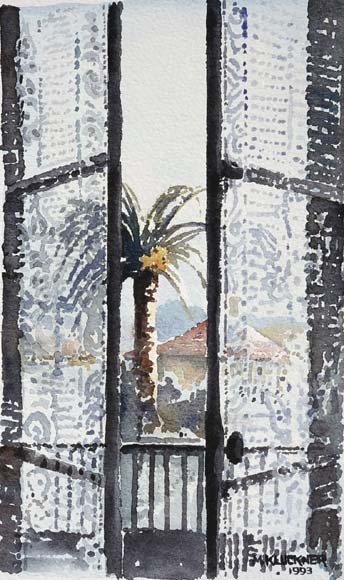 As a postscript, in 2005, "Christine at the Hotel Provencal" became the cover image for poet Susan Snively's Skeptic Traveller, published by David Robert Books of Cleveland, Ohio. The French Riviera in the winter-time is an exquisite pale jewel of early sunsets and translucent clear skies, quiet towns and calm streets. Above: Hyères-les-Palmiers (of the palm trees), a 19th-century wintering place with an intact medieval centre, surrounded by more suburban streets, hotels and villas from recent times. 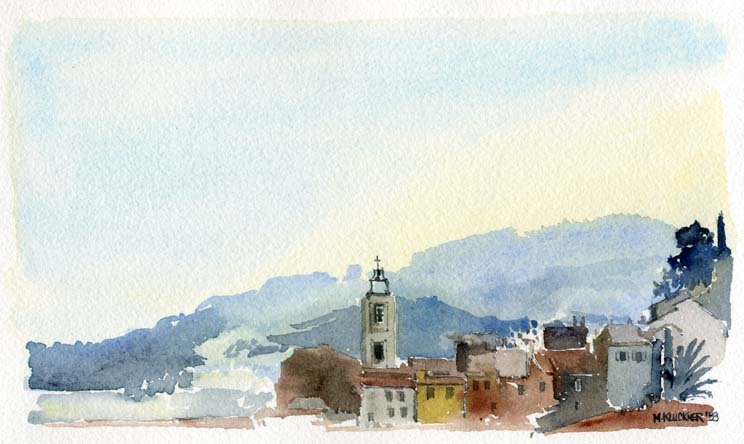 This watercolour was the view from the public garden on the hill above the old town. Below: Antibes, one of the key fashionable spots on the Côte d'Azur. This looks along the beach toward the old town, whose castle is now a Picasso museum due to his residence there for a time in the '40s. 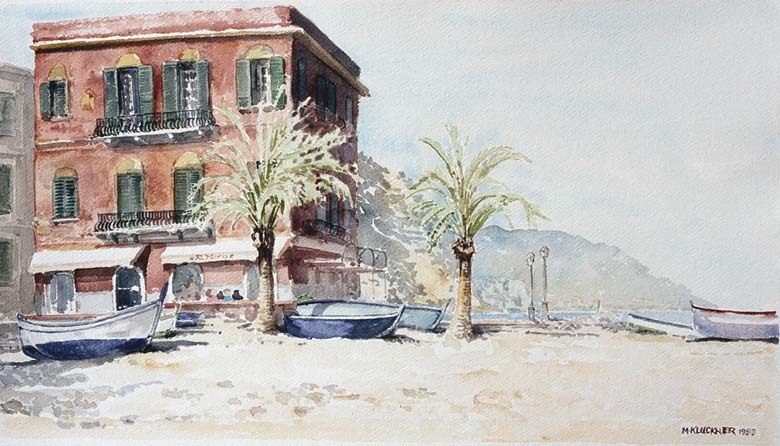 The famous Cap d'Antibes of Somerset Maugham, Evelyn Waugh and F. Scott Fitzgerald's Tender is the Night was the headland behind and to the left of me as I painted, its walled villas impregnable to plebs like us. Above: Early January, and went away from the balmy, palmy coast and up into the chilly mountains. Villecroze, in the Haute Var area of Provence, was a village largely unchanged by tourism, although obviously benefitting from it. There seemed to be an active town life, not limited to old men playing petanque in the market square and unemployed young ones standing around in the bars at the video and pinball games. Sheep, wine and pottery, plus local "produits de la ferme," including chevre, were the prime occupations. The shops catered in part to the comparatively wealthy English who had bought up the old cabanons, à la Peter Mayle in "A Year in Provence." 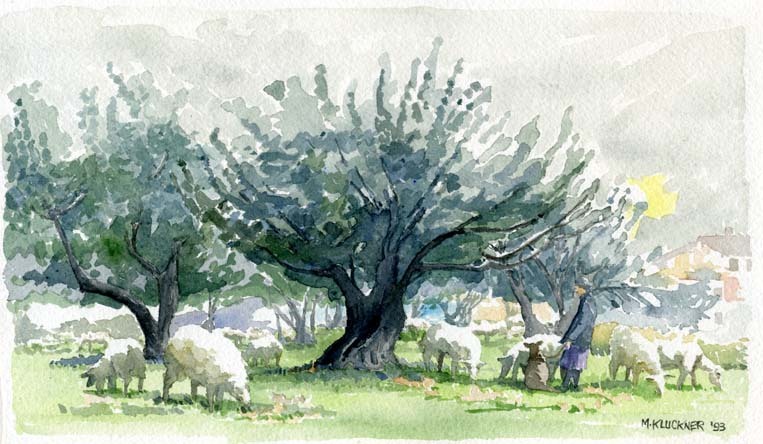 There were some very picturesque and bucolic scenes on the edge of Villecroze, including a woman grazing her flock of ewes in an olive grove on the side of the road. Robert Louis Stevenson loved the native trees of the Midi, and wrote that the olivier, "from the most shattered bole can put out smooth and youthful shoots, and begin a new life upon the ruins of the old." The less-sentimental Stendhal felt that olive trees were "the ugliest trees in the world," because they always look "dyspeptic and crippled." At a gîte at La Croix-Valmer, on the coast near St. Tropez, from January 16 to 23rd, a garden of mimosas and roses in bloom and oranges ripening on the trees. 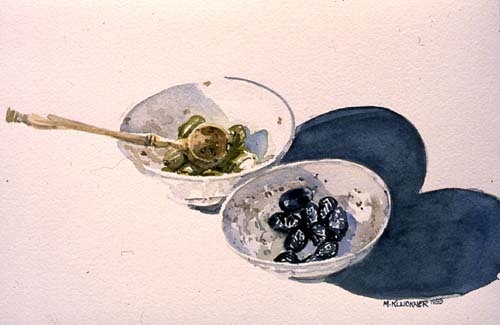 We bought green and black olives at the market, put them in separate bowls and served them with a perforated olive-wood spoon. The sun was warm and there was little incentive to get up from the lunch table on the terrace. Cats and Renaults in the narrow backstreets of a Côte d'Azur town -- probably Nice. Poor unloved cats. It's the dogs of France that get all the care and attention. 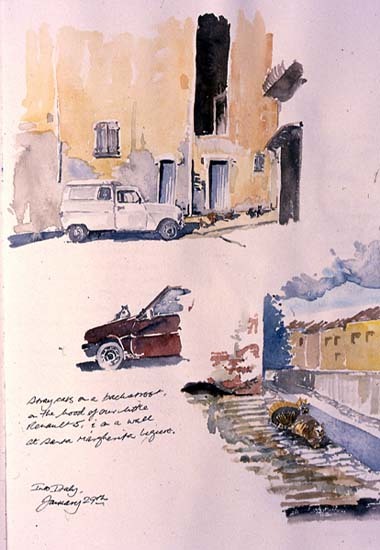 This is a page from the commercial sketchbook I took which had paper too smooth to make really good watercolours -- it wouldn't hold a wash and was too thin, but its surface was excellent for writing on. So this part of the effort was much more like a journal than the rest of the pictures I did. 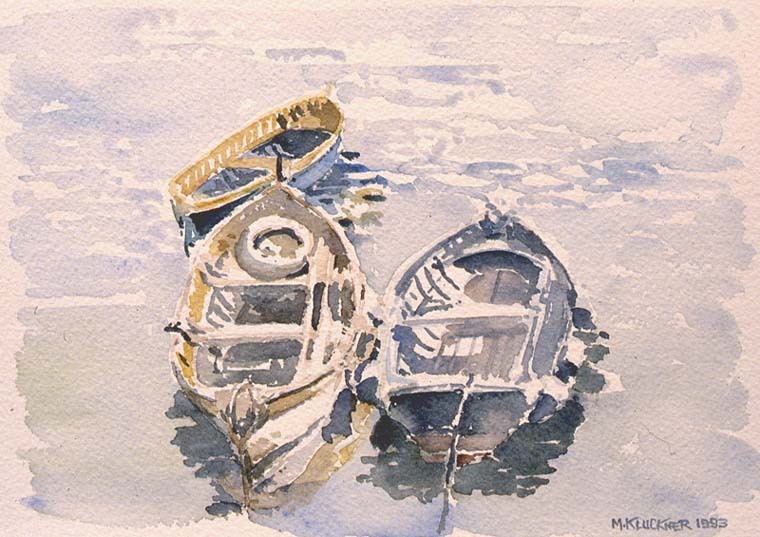 A string of rowboats off the quay at Santa Margherita Ligure on the Italian Riviera near Portofino on a sunny February morning. 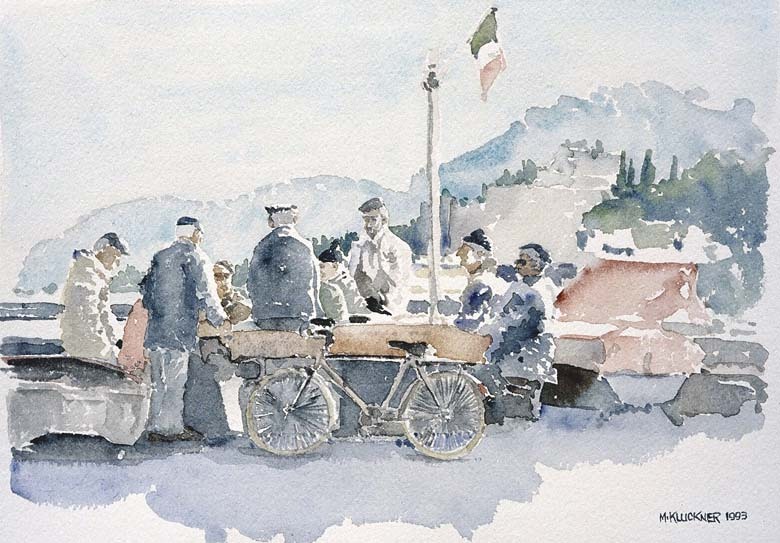 I sat on the wharf with my feet dangling over, next to Christine, who read a book, while the promenading townspeople walked by and discreetly inspected my efforts. As in France, we could hear the word for "English . 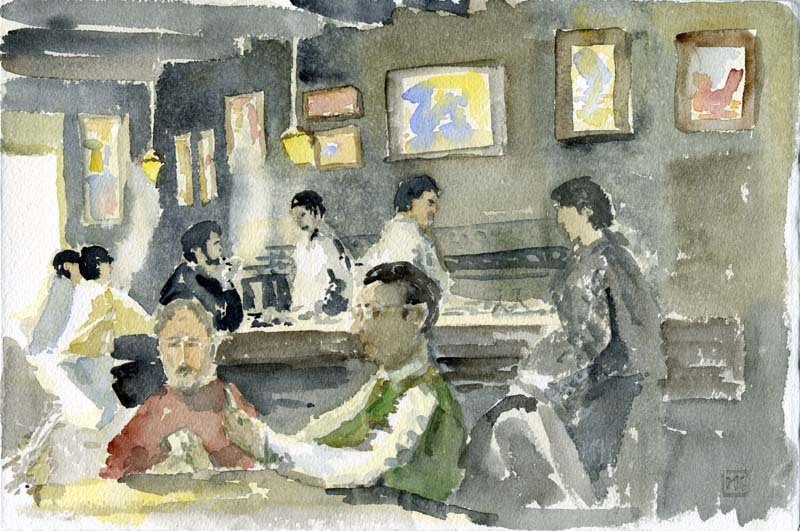 . . " in their muted conversation--sketching and painting being associated with the traditional English tourist's behaviour. One of Siena's narrow streets, near the Duomo, in February. The city was so well-built and is so well-maintained that it is difficult to come to terms with its great age. The English writer Leigh Hunt noted in the 1820s that "the first novelty that strikes you . . . is the singular fairness and new look of houses that have been standing for hundreds of years. This is owing to the dryness of the Italian atmosphere. Antiquity refuses to look ancient in Italy." Laiguéglia, one of the smallest of the towns on the coast midway between San Remo and Savona on the Italian Riviera. Al Moro ristorante, fishing skiffs pulled up on the beach. One of the few towns along that stretch of coast where the rail line doesn't separate the town from the beach. The mist from the sea turns the distant headlands from a golden ochre to a cerulean blue.